Lethargy, trouble increasing muscle mass, and low libido are three of the most common symptoms of low testosterone. If you’re still in your twenties or early thirties and experiencing any of these symptoms, you may have low testosterone levels. For most men, testosterone starts declining around the age of 30, decreasing between 0.4 to 2.6 percent each year (1). By the age of 60, 20 percent of men have below average testosterone levels (2). The good news is there are several ways to treat low testosterone and help you regain the vitality and virility of your youth. The normal range for testosterone is between 300 to 1000ng/dL. If your testosterone is below 300ng/dL, your doctor may prescribe testosterone replacement therapy (TRT). Testosterone replacement therapy is the process of using synthetic testosterone to boost your levels back to normal. Wait, isn’t injecting synthetic testosterone kind of like taking anabolic steroids? The two treatments are similar, but testosterone replacement therapy aims to raise t-levels to the healthy range between 300 to 1000ng/dL, while anabolic steroids aim to raise your testosterone beyond that range. Also, the of risks of doing testosterone replacement therapy are not as high as they are in taking anabolic steroids. In fact, they are considered side effects instead of risks. We wrote about TRT here. Although there is some research indicating that testosterone replacement therapy leads to prostate cancer, it is inconclusive. However, studies have found a correlation between the two (3, 4). Improved erectile function (5, 6). Reduced symptoms of depression (8, 9). Your diet plays an important role in maintaining your quality of life as you age, not to mention your testosterone levels. Most of the foods that raise your testosterone are the same foods that you should be eating for optimal health. Research shows adequate protein is necessary for testosterone production (10, 11). Including a protein source with each meal and after your workout can keep your testosterone levels primed. It is also important during puberty. Restricting protein during this developmental stage can lead to long-term hormonal imbalances (12). Men who eat a diet high in hydrogenated vegetable oils have an increased risk of developing low testosterone (13). Cutting down on fast food, deep-fried foods, and pre-packaged foods can lower your intake of these unhealthy fats. Instead, focus on eating fatty fish, nuts, seeds, avocado, and olive oil. Also, eating carbohydrates before and after your workout can also give you a testosterone boost (14, 15). Research shows that several vitamin and herbal supplements can improve your testosterone levels. Vitamin D: One study shows that taking more than 3000IUs of vitamin D per day can aid in testosterone production (16). Boron: Boron is an essential mineral that you don’t hear a lot about. Foods that are naturally high in boron include avocado, almonds, and walnuts. Preliminary research shows that it may have testosterone boosting effects (17). D-Aspartic Acid: There isn’t a ton of research available on D-aspartic acid, but the research published looks promising. One study found 2.66g of D-Aspartic acid per day increased testosterone production in infertile men by 30-60% (18). Zinc: Zinc has the most consistent research to support its use as a testosterone booster. It can raise testosterone levels in young adults and seniors. If you take a zinc supplement, take at least 30mg for maximum effects. Shilajit: Shilajit is a tar-like substance found in the Himalayan mountains. One double-blind, randomized, placebo study found that 250mg per day significantly increased testosterone levels in adults over the age of 45 (20). Read: The top 20 testosterone boosting foods. Testosterone boosting supplements increase your body’s testosterone production. Unlike testosterone replacement therapy, which involves taking a synthetic source of testosterone, testosterone boosting supplements include natural ingredients that support your body’s natural testosterone production. Taking a testosterone booster instead of testosterone replacement therapy also lets you avoid the potential side effects. However, not all testosterone boosters on the market are made equally. Some contain filler ingredients that don’t have research to back them. Some hide their ingredients in blends, which makes it difficult to know what you’re getting. 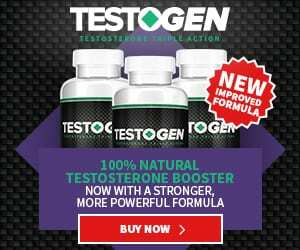 The best testosterone booster on the market is Testogen available here. It contains zinc, D-aspartic acid, boron, and vitamin D. All these ingredients have research to back them. One of the best ways to increase your testosterone levels naturally is through regular exercise (21). Resistance training is one of the best forms of exercise(22). Research shows that resistance training can raise both human growth hormone and testosterone in young and elderly people (23). However, younger people seem to get more of a testosterone spike from exercise than older people (24). Research also shows taking creatine monohydrate with your workout can further increase your testosterone levels (25). It’s no secret that getting a good night’s rest is vital for maintaining optimal health and keeping your testosterone levels at a healthy range. Experts recommend at least eight hours of sleep each night. Research consistently shows that the more sleep you get, the higher your testosterone levels will be (26, 27). Sleeping five hours per night can reduce your testosterone levels by 15 percent (28). Testosterone levels in your blood rise shortly after you fall asleep, so REM sleep is particularly critical (29). Testosterone levels reach a peak within the first three hours of falling asleep (30). Stress comes in many different forms such as hard training, financial worries, relationship anxieties, and work and school stress. It can lower your testosterone and suppress your endocrine function. Stress also decreases testosterone’s effect on your body by raising cortisol (31). Although eliminating stress completely isn’t attainable for most people likely, it’s important to reduce it by doing things like meditating, eating a healthy diet, getting enough sleep, and exercising regularly. Treating low testosterone is not difficult if you stick to the basics listed in this article, which include making several lifestyle changes. Eating a healthy diet that is low in hydrogenated vegetable oils and getting at least eight hours of sleep every night are two great starters. You may even want to consider talking to your doctor about testosterone replacement therapy if you feel you may need further treatment. And don’t forget about testosterone boosters. These testosterone boosting supplements have been proven to increase testosterone.